Matt Hardigree: We’re media, try to guess who we are! Gentleman: I have no idea. Gentleman: I don’t know it. Matt Hardigree: Who are you here with? Gentleman: I’m with Mercedes. I do Mercedes classics. Me: Really? I’ve been thinking of a story about a Mercedes classic, the Mercedes SSK from the 1920’s. Do you know about it? Gentleman: I do not. 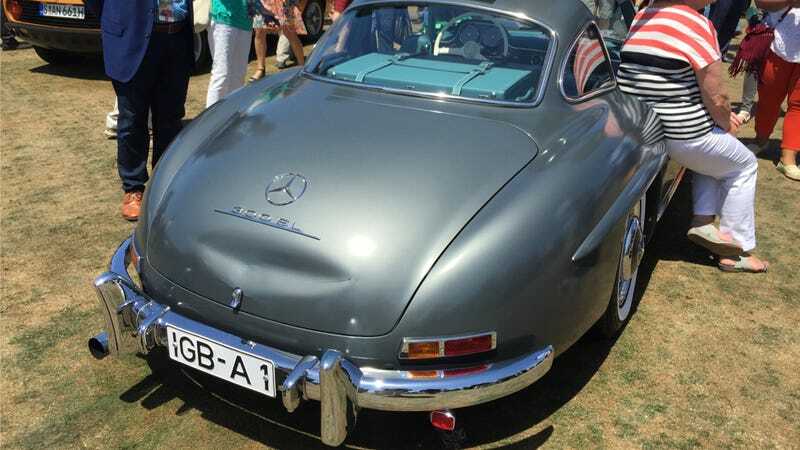 I only know about the 300SL Gullwing and Roadster. Matt Hardigree: What cars do you drive? Gentleman: I have a Mercedes SLS. I also have a Ferrari, and a Ghia. Matt Hardigree: Cool! A Ghia! What kind? Gentleman: It’s very rare. Less than 100 made. It was the Rat Pack car. Matt Hardigree: You mean Dean Martin and all those guys? Gentleman: Yes, they all got one. Except for Sammy. Me: Uh, except for Sammy? Matt Hardigree: So, where you from? Nicole Conlan: Oh, I’m from Denver! Where in Denver do you live? And thus concludes the most Pebble Beach conversation at Pebble Beach. UPDATE: The gentleman in question wrote me an email and seems to be nonchalant and amused. [REDACTED] of Mercedes Benz saw this today and knew it was me. Funny. I’ll assume all of your gang found their way to the field.